Over the Easter holiday break we took the kids to Far North Queensland for a sun and surf holiday. On one of the days we did a road trip north to the Daintree and Cape Tribulation. As we were wandering around I felt like I was in familiar territory, yet I knew I had never been there before. It took the walk onto the beach at Cape Tribulation for me to realise why I thought I knew this area so well. 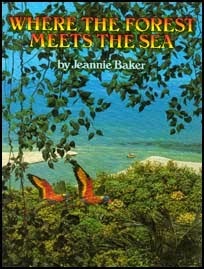 And it's all thanks to a children's picture book by Jeannie Baker called Where The Forest Meets the Sea. 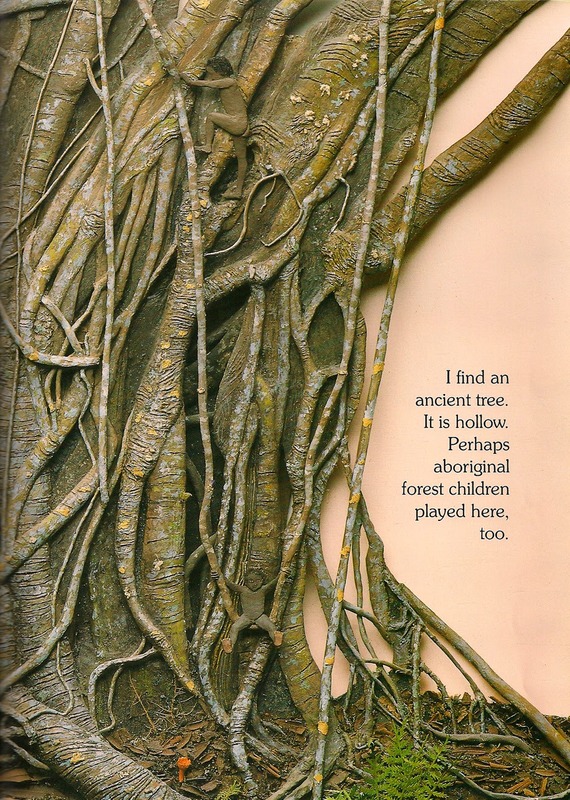 Baker wrote her book back in 1987 - I fell in love with her collages instantly. "The place, the people, and the predicament are real. This forest is part of the the wilderness between Daintree River and Bloomfield in North Queensland. There remain at the making of this book only 296,000 acres of wet tropical rain forest wilderness that meet the ocean waters of the Great Barrier Reef. Small as it is, this is the largest pristine area of rain forest left in Australia. 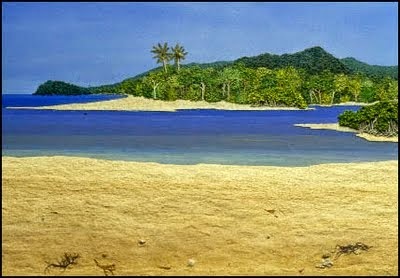 The artist made two extensive field trips to the Daintree Wilderness to research and collect materials. These relief collages are constructed from a multitude of materials, including modeling clay, papers, textured materials, preserved natural materials and paints. The collages are mostly the same size as the reproductions." Much of the Daintree Rainforest is part of the Wet Tropics of Queensland World Heritage Site listed by UNESCO in recognition of its universal natural values. Below I have included a few pictures that I took whilst in Cape Tribulation. 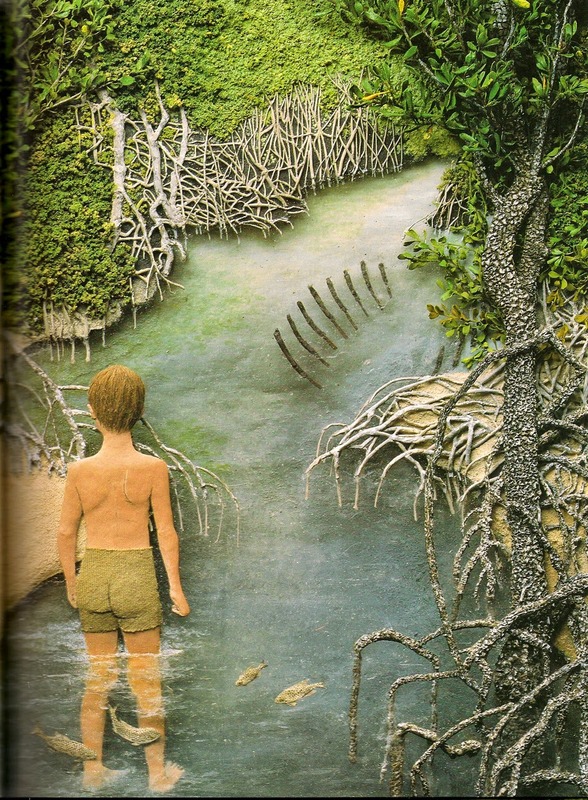 I'm not sure I would walk through a creek or the mangroves like the boy in the book though. Beware of croc signs are everywhere, especially along the Daintree River itself! There are a few roads and townships along the southern end of the Daintree National Park. To see the park, visitors are encouraged to take organised tours through designated areas only. Cape Tribulation is the last town on the coast road north. A basic dirt road meanders north from here, otherwise, a big loop road around the back of the National Park will eventually take you north to Cooktown. Cyclone Ida had been through this area just last week, and it was still looking fairly windswept and very wet!